Maple Gate specializes in less-than-truckload (LTL) shipments. We have developed a simple, useful, cost-efficient process that will guarantee that your goods will be shipped and will arrive at your destination under the best conditions damage free and on time. For further information, please visit our Logistics, LTL and Benefits pages. Please note that although our specialty is LTL freight, we will gladly transport your truckload (FTL) shipments throughout Canada and the USA with the same enthusiasm and commitment to great pricing and service. Maple Gate Freight Systems Inc. offers a variety of transportation equipment to meet the various requirements of our customers. From Dry Vans and Reefers to Super B Vans and Flatdecks, Maple Gate has the right equipment for you. Please visit our Equipment page to learn more about the different equipment we have to offer. At Maple Gate Freight Systems Inc. we understand how valuable your time is. For that reason, we have provided you with several online services including online rate quotes, shipment booking and shipment tracing. Finally, Maple Gate Freight Systems Inc. has compiled a list of all the forms you may require in order to ensure the safe and timely transport of your freight. Please visit our Online Forms page for further information. 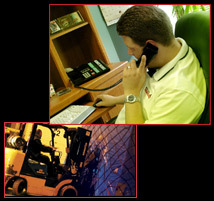 Maple Gate Freight Systems Inc. has all the components required to guarantee your complete satisfaction. Email Us or call Maple Gate today at 905-567-8810, if calling from the Toronto area, or call toll free 800-320-0524. and join our many satisfied customers. Direct Drive Between Canada and the USA | Maple Gate Freight Systems Inc.